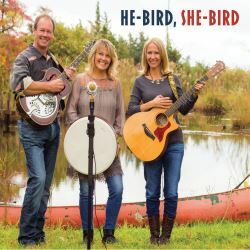 Stir up a gravel-silk-and-honey vocal blend, add strings and wings, and you’ve got He-Bird, She-Bird, a harmony-driven Americana roots music trio from Long Island, NY. Sparks of contemporary folk, country, bluegrass and gospel fuel their stand-out originals & spirited cover interpretations. In June 2017 they released their debut album, He-Bird, She-Bird, featuring twelve original songs with full band instrumentation. Check out the distinctive sound of He-Bird, She-Bird – people are flocking to see them!